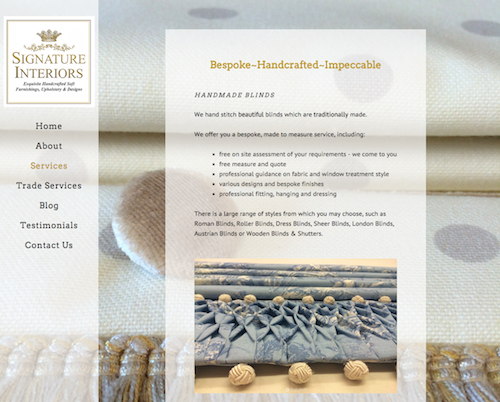 Signature Interiors offers elegant and sophisticated design services which site owner Liz Cox was able to convey on her business website at a glance. Liz selected “Serendipity,” one of our recommended styles, because it allowed her to display numerous photographs and videos with ease. This is vital to her business as visual images are a critical component to showcase the services and quality of work Signature Interiors provides. Liz took advantage of a full bleed background image which creates a fresh and modern look for her homepage. Customizing the opacity settings in the Sitebuilder ensures that content is easily readable while maintaining transparency that doesn’t interfere with the dramatic impact of the graphic background. The vertical navigation and use of our flyover menu keeps the website pages organized and easy to navigate. A luxurious color palette was inspired by their rich logo which creates a clean and cohesive feeling throughout the website from the fonts to the Call to Action buttons used to encourage visitors to get in touch. Hi, I like very much the rotating banner, what was use to create it? i didn’t understand, how i can get my sites featured. i think it deserves. Feel free to leave a link to your website, and you could be featured in a future article! Great site Hrsimrn! Thank you for your submission! Thanks Ernest! this is great!